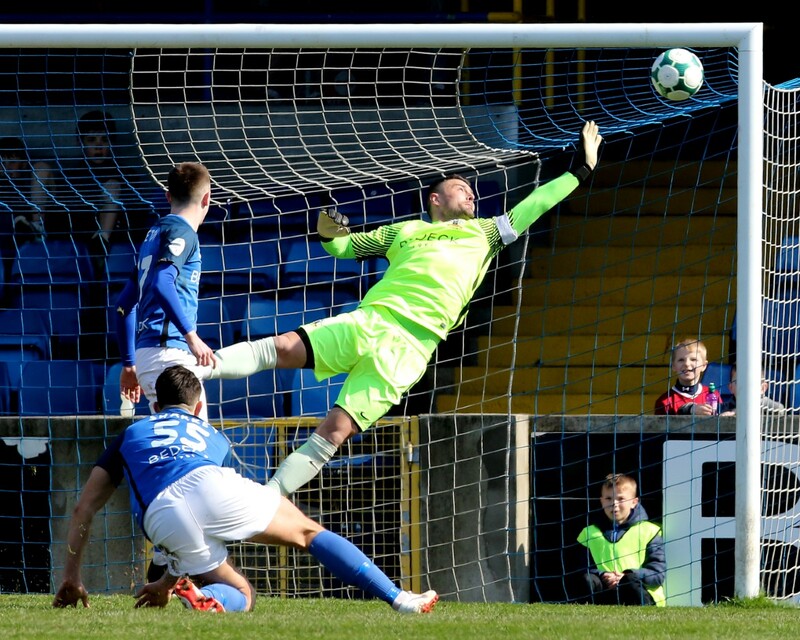 Glenavon moved back to the top of the Danske Bank Premiership on Saturday with a 2 – 1 victory over Glentoran at the Oval. 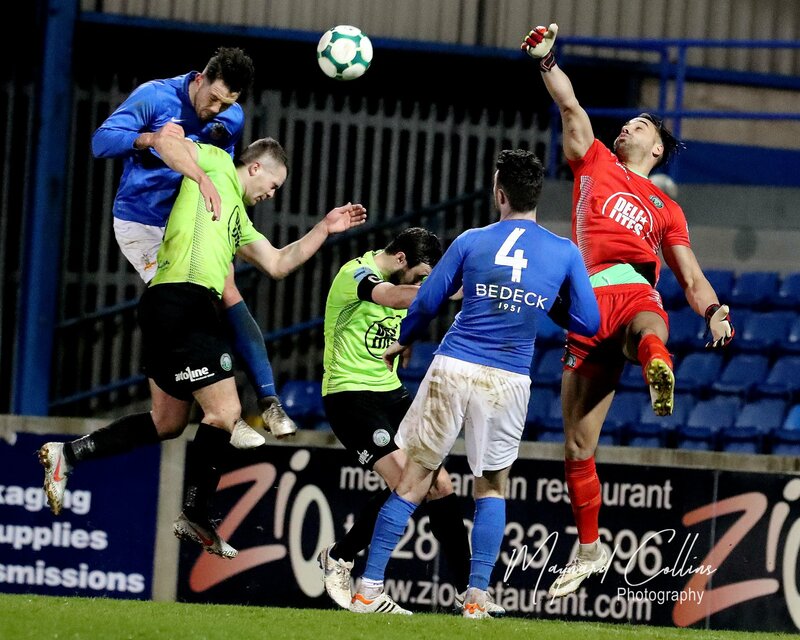 The Lurgan Blues came from behind to win an ill-tempered game which saw referee Keith Kennedy brandish no fewer than four red cards, with John Herron, Calum Birney and Willie Garrett being sent off for the hosts, while Rhys Marshall was dismissed for the visitors. Glentoran opened the scoring through former Glenavon striker Robbie McDaid in the 21st minute, and the Glens managed to hold onto their lead until half-time despite already being down to nine men by that stage, Herron and Birney having both been shown straight reds for reckless tackles on Mark Sykes. 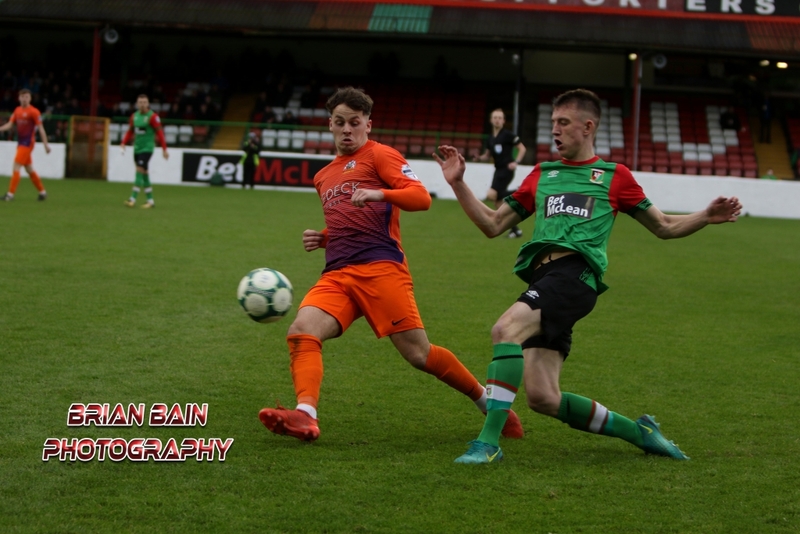 It was always going to be a case of Glentoran setting up to try and preserve their lead in the second period, allowing Glenavon to dominate possession and inviting the visitors to attempt to break them down. 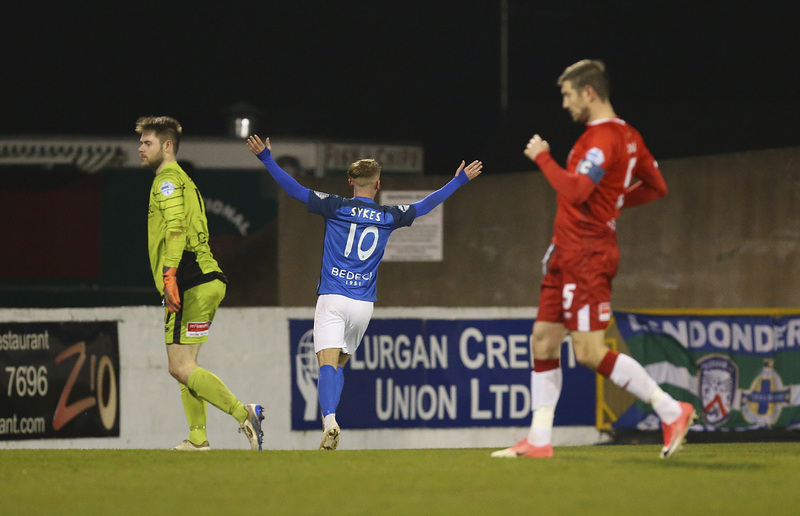 The Lurgan Blues did just that, as goals from Andrew Hall and substitute Jordan Jenkins ensured they maintained their perfect away record this term and moved back to the top of the league table at the expense of Linfield, who suffered a shock 2 – 1 defeat away to Ards. Garrett and Marshall were each shown second yellow cards for their part in a melee late on, as the game ended with just 18 players on the pitch. Both sides struggled to settle into the match in the early stages. 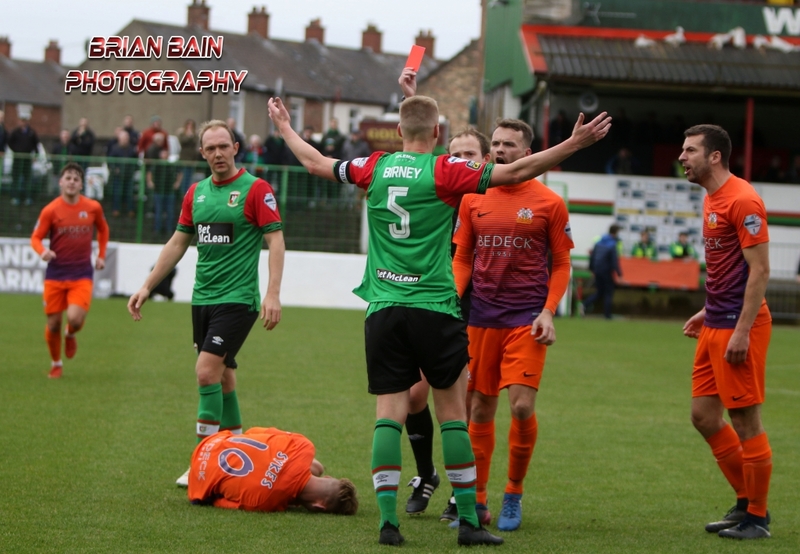 For the Glens, John McGuigan saw his tame effort comfortably saved by Jonathan Tuffey in the second minute, while at the other end full-back James Singleton had two efforts blocked in quick succession following a Hall corner in the seventh minute. The opening goal arrived on 21 minutes. Birney sent over a cross from the left which Caolan Marron couldn’t clear and the ball fell to McGuigan. He held off Doherty before curling a cross into the box from the right flank which picked out McDaid. The ex-Glenavon striker directed his header into the bottom left corner, beyond the dive of Tuffey, to open the scoring for the home side. A minute later, Hall whipped in a free-kick from distance which travelled all the way through the crowded penalty area and forced Elliott Morris into making a save. From the resulting corner Mitchell picked out Singleton at the back post, but he couldn’t direct his header on target. The Glens were reduced to 10 men in the 24th minute when Kennedy gave Herron his marching orders for a high tackle on Sykes. Replays suggest that it may have been a harsh decision to send the midfielder off. However, there can be no doubt that captain Birney fully deserved the red card which he received in the 41st minute. Again it was Sykes who was on the receiving end, as Birney lunged in on him dangerously from behind, and the young midfielder was lucky to avoid serious injury. Calum Birney gets his marching orders from Keith Kennedy. As if to say that he wouldn’t be intimidated by the rough treatment being dished out to him, Sykes surged forward and fired a shot wide of the far post from 20 yards two minutes before the break. 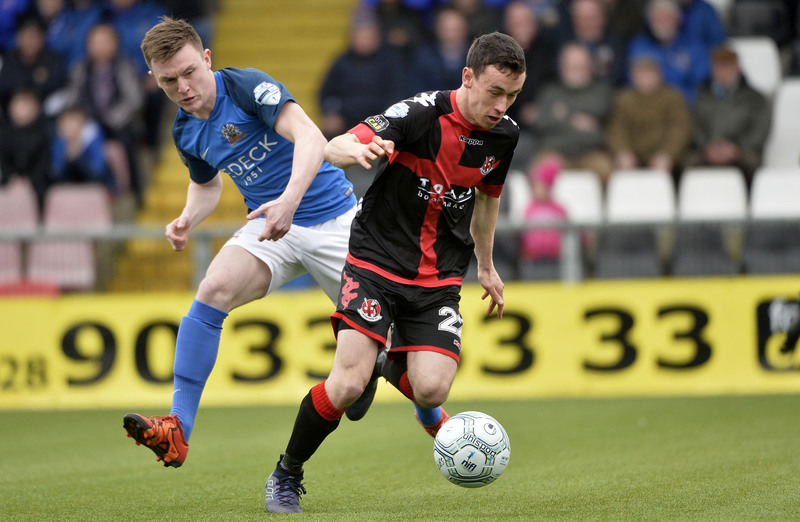 Despite their numerical advantage Glenavon knew that it wouldn’t necessarily be an easy task to break Glentoran down in the second half, and so it proved. The equaliser arrived soon enough. In the 55th minute Mitchell sent in a corner from the right which Singleton won at the back post. 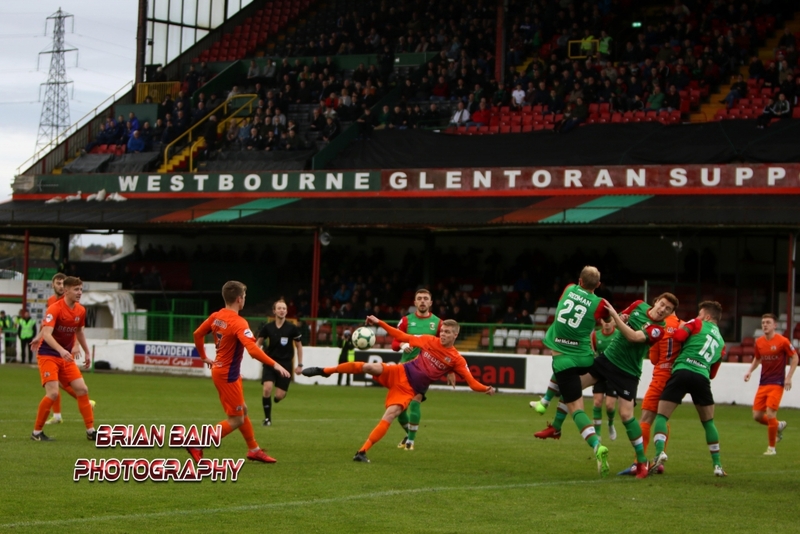 When the Glens failed to clear the loose ball, Marshall got his boot to it and sent a shot in which cannoned back off the post. Hall met the rebound just ahead of Stephen Murray to net his fourth league goal of the season. Rhys Marshall’s shot rebounds back off the post before Andy Hall taps in the equaliser. However, the second goal proved to be more elusive to come by. In the 63rd minute Murray looked to be clean through on goal, only to be denied by an excellent last-ditch tackle from McDaid. A minute later, Ben Doherty, who had an impressive game at the heart of the Glenavon midfield, fired his effort from distance over the bar. Hall came agonisingly close to scoring his second of the afternoon in the 71st minute when his free-kick struck the post. Twice the Glens might have grabbed a goal against the run of play when two Ross Redman corners were headed goal-wards by substitute Willie Garrett on 78 minutes. The first was cleared off the line by Josh Daniels, the second by Marshall. Sykes tested Morris with a driven shot from the right which the Glens keeper had to palm clear in the 84th minute. 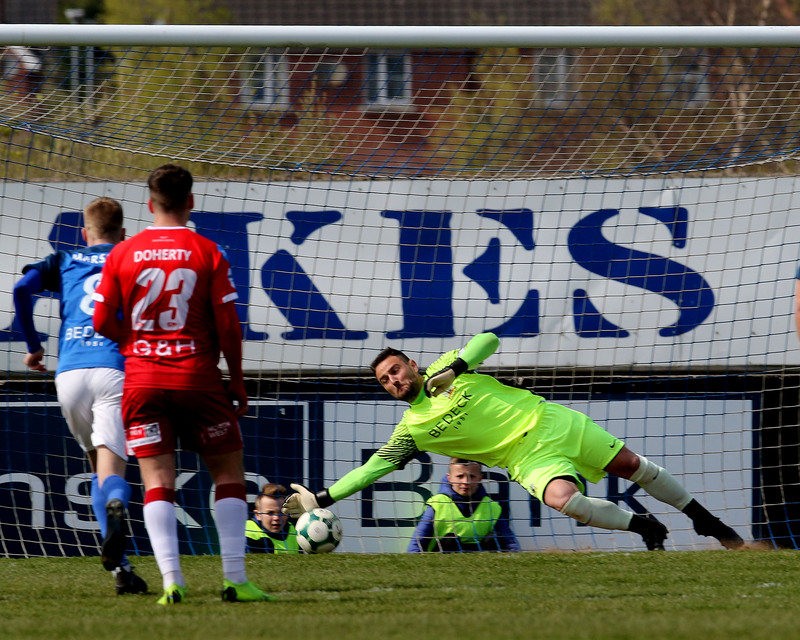 Just when it looked like the home side would hold on for an unlikely draw, two of the visitors’ substitutes combined in the 86th minute to produce the goal that returned Glenavon to the Premiership summit. Daniels’ throw-in from the left was headed clear by Glens full-back Nathan Kerr, but he sent the ball only as far as the edge of the penalty area, where Conor McCloskey was lurking. McCloskey struck a low shot with his right foot which Morris dived down to his right to save, but there was young Jenkins, waiting on the six-yard line to bury the rebound and send the Lurgan Blues back to the top of the table. The drama still wasn’t over. In injury time Sykes was fouled for the umpteenth time, on this occasion deep inside his own half. A melee ensued, with Garrett and Marshall at the heart of it, and Kennedy showed each player their second yellow card, followed by the obligatory reds. Glenavon will be hoping to secure their seventh straight league win next Saturday (October 27th) when they entertain 11th-placed Newry City at Mourneview Park (kick-off 5pm).